A recent poster for a performance of the new version of Rapport. 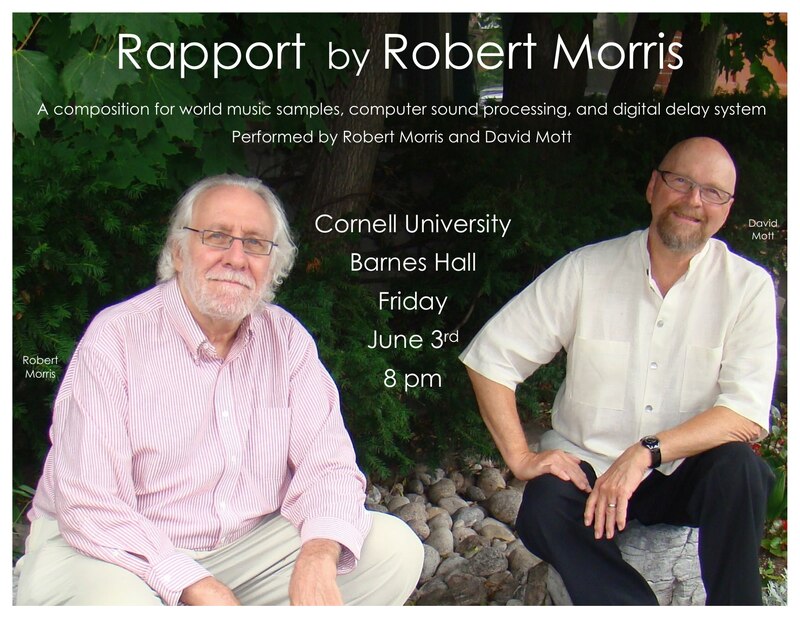 Rapport was conceived in 1971 as an improvisational piece for two performers using pre-recorded tapes of music to be processed through electronic music equipment. By 1973, the nature of the piece stabilized into a set of specific instructions for performance. In 2010, I translated the original electronic hardware into computer software so Rapport could be performed on a laptop computer. In addition, the recorded music was selected anew; however, some of the original items were preserved. The prerecorded “samples” are drawn from classical, popular, traditional (i.e. folk), and ritual music selected from a large selection of different geographical areas on each continent. Only a few of the excerpts are of western classical or pop music. The samples are not directly heard but sampled, modified, intermixed, and transformed by the performers in real time. Every performance is unique, often discovering unusual combinations of musical sound and reference. One performer plays the synthesizer, which can alter the prerecorded music in various ways, and the other performer mixes the output of the synthesizer and unaltered musics and sends it into the digital delay system. The result is an intricate canonic web of musical texture varying continuously between montage to mixage depending on the actions of the performers. The length of the pre-recorded material is 30 minutes, so the piece has to last a little less than a half an hour. While the piece always begins in the same way with a piece of South Indian (vina) music and/or mixed with an Egyptian art song accompanied by an oud, and/or mixed with a piece of Cambodian theater/dance music, each performance takes its own course, exploring the possible interconnections between the recorded music and the computer generated and transformed processes and sounds, depending on the improvisational skill of the performers. The performance can end with another South Indian selection, this time a vocal improvisation; however, the states of the delay system, the synthesized sound, and the previously selected prerecorded material may mask or disguise this selection. The idea behind the piece was to allow two performers familiar with world musics and well-versed in live electronic music performance to improvise a piece integrating musics of all peoples and times into a vast tapestry of sound—a non-hierarchic tribute to music making in its many guises and incarnations. In its original form, the piece was designed to be played in a comfortable setting for a small group of people invited to attend a performance. Before each performance, the nature of the piece was explained and the electronic component illustrated; after the performance, the performers encouraged discussion and answered questions. Refreshments were often served to heighten the relaxed and informal nature of the event. In its present form, Rapport can be performed in any venue including installations.